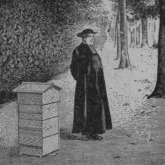 The Warré hive is named after its inventor, Abbé Émile Warré (1867-1951). 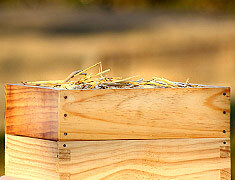 hive that was simple, economical, bee-friendly and assured a surplus for the beekeeper. Pat Cheney and David Heaf translated the text in 2007 from the original French. 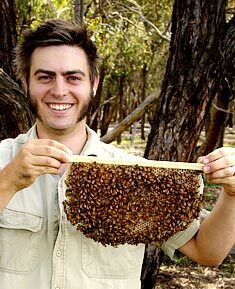 Various articles about the Warré hive by David Heaf were published in bee journals around the world, including The Australasian Beekeeper issue of June 2008. We read this article and immediately recognised that the Warré hive represented a paradigm shift in beekeeping – albeit over 50 years after Warré’s death. We had been experimenting with ‘natural comb’ beekeeping in Langstroth hives for a number of years, but were immediately attracted to the key design elements and unique management techniques central to Warré’s hive and philosophy. We were particularly excited about how the hive would suit Australian beekeeping conditions. After populating the first Warré hive in Australia in 2009, we've been constantly impressed by the performance of the hive, not only in our own apiaries which now collectively number hundreds of Warré hives, but also those of our students. 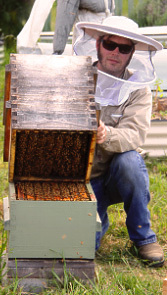 Please see below for an overview of the main features of a Warré beehive. working skills could make their own hive from locally sourced timber. that of a tree hollow. Our modified version is slightly larger, and features dimensions of 308 x 308 x 240 mm. The reasons for this are purely practical - the standard timber plank size in Australia is 240mm. Our modified internal dimensions are the industry standard for 8 frames/combs in Australia, and allow space to remove individual combs with the use of our ‘open frames’. Each box features protruding handle cleats that are angled to shed water. 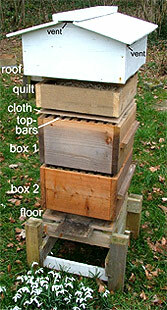 A standard Warré hive is 2 boxes high (approximately 40L volume), although a height of 6 boxes or more can be achieved during a large honeyflow. are not needed to support the comb due to the small surface area. nest to move downwards, in a healthy process of constant comb renewal. them, and the honey acts as an insulating thermal dome. boxes. 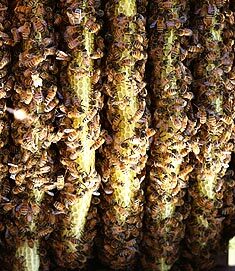 The cyclical process of renewal is healthy for the bees as the oldest comb is harvested from the colony and not returned to the hive. honey and stressing the bees. which can be easily and quickly renewed once a year if necessary. time you open the hive, you are greeted with the history of the colony. particularly if the top layer of the roof is painted white. 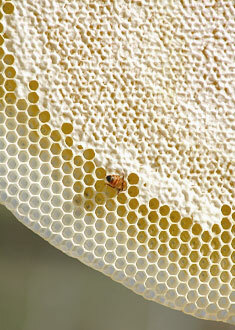 our larger colonies, heavy honey flows and hot summers. The entrance may be reduced in size during the cooler months. 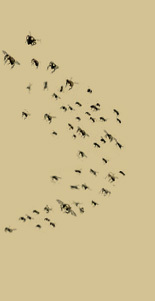 population of adult beetles within the hive. 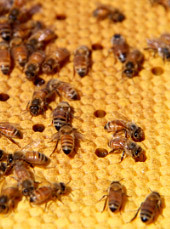 Click here if you are interested in learning Natural Beekeeping. To find out more about how the Warré hive benefits both bees and beekeepers, come along to one of our Natural Beekeeping courses.